Install the DevArt dotConnect for Oracle drivers. (This includes the DevArt Entity Developer tool). 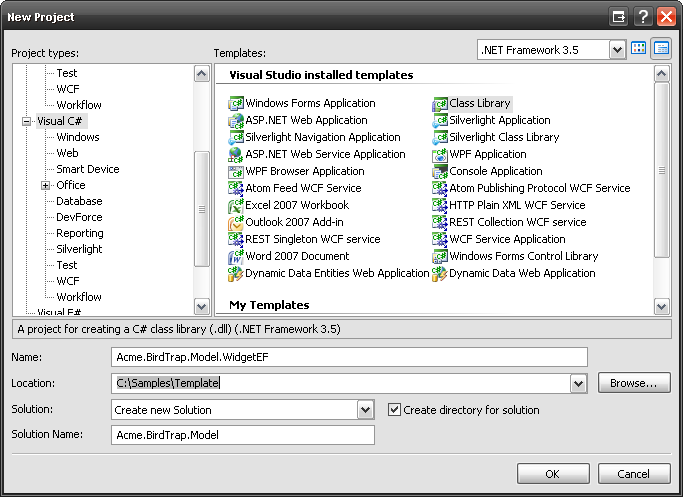 In Visual Studio 2008, select File | New Project | C# Class Library. We have opted to follow a [Company].[Application].[Component]. [Module][Suffix] project naming convention. For example: Acme.BirdTrap.Model.WidgetSL would denote a Silverlight Model project for the Widget module of the BirdTrap application at Acme company. Add the references so we can use Oracle and the EF. But, wait. Before we add the references, we need to decide where the referenced items will live. Every solution should carry with it all the components (DLL’s) that are not part of the official Microsoft environment and that are needed to build it. These should be checked in to SCM with that solution. If not, then developers will be pointing projects to their Program Files directory and/or other random places when they add references to projects. To address this problem, we create two solution level folders, one for dependencies and one for installations. Contains the Full Install package for each of the Third Party tools we use. These are checked in and promoted along with the code. This ensures that everyone is building with the same set of tools. If someone updates their PC and our solution to use a new version of a tool, the promoted code will be accompanied by a new Install package so all developers can update the version of the tool their using before trying to compile the updated code. Contains all the DLL files that are referenced by the projects in the Solution, except the ones that are part of the Microsoft .Net Framework. In so far as technologies like Silverlight are installed to the GAC as extensions to the .Net Framework, those DLL’s are referenced from the GAC and are not copied to the dependencies folder. All other referenced DLL’s ARE copied to dependencies though. This includes the Silverlight Toolkit files, the IdeaBlade files, DevArt files, etc. So, before we can create the references in our WidgetEF project, we need to create our installations and dependencies folders and copy the DLL files from the installed locations in Program files to the appropriate locations in the dependencies folders. Now the files are in the right place, we can add the references to the WidgetEF project. From the Add Reference dialog, on the .NET tab, select the System.Data.Entity 3.5 and System.Runtime.Serialization 3.0 components. On the Browse tab, navigate to the dependencies\DevArt dotConnect folder, select the DevArt.Data.Oracle.Entity.dll. Create the Entity Model. In the WidgetEF project, select to Add a New Item. Select the Data category, and choose the DevArt Entity Model item. When naming the model file, we have been naming them Model_EF. For this walkthrough, I will name the model file: Model_WidgetEF.edml. At this point, DevArt’s Entity Developer will open. Select the Project |Properties menu item. Select the Model tab. Change the EntityContainerName to Entities. The one that the tool provides is based on the model file name, which is not useful to us within the application. Naming ALL of your model Containers as Entities means that all of your modules can use Namespace.Entities.ObjectClass to access the object classes. Change the Namespace to the correct one. Again, the default is based on the model file name, so it will never be correct. I used: Acme.BirdTrap.Model.WidgetEF. Check the “View Generation” checkbox. Use the Database Explorer pane to connect to your database. Drag the SAMPLE_WIDGET table over to the Model pane. When we created the SAMPLE_WIDGET table, we used a SEQUENCE and a TRIGGER to auto-increment the primary key Id field. This makes our table behave the same way as an Identity column in SQL Server, which EF knows how to deal with. We need to tell our model, that the SampleWidgetId field is an autonumber field. DevArt has made this easy. In the Project Explorer, there are two main branches. The top branch (Acme.BirdTrap.Model.WidgetEF), is the Conceptual (or Object) model. The lower branch (Acme.BirdTrap.Model.WidgetEF.Store) is the Storage (or Database) model. Open up the lower branch (the .Store branch). Expand the SAMPLE_WIDGET table branch. Now, in the Properties pane, you will see the properties of the SAMPLE_WIDGET_ID column. Select the Store Generated Pattern property and change the value to Identity. The XML definition of the model itself. This corresponds to the .edmx file created by the MS Entity Designer. You will usually edit this file using the DevArt Entity Developer tool, but you will occasionally need to edit the XML directly in a text editor. There is plenty of technical documentation on MSDN about this file, but none of it is particularly instructive. The generated code for your entities. Do not change this file. Period. This XML file defines the tool settings, output path and connection string used by the Entity Developer and the code generator. You will not need to change this file until you need to build against a different database. These changes will be explained further in a later posting on building and deploying the model solution. The pregenerated views used by the Entity Framework. If these views are pregenerated, they can be compiled into the assembly and they will not need to be generated dynamically at application startup. In my projects, this seems to have saved us anywhere from 1-10 seconds off the total spin up time. Last, but not least, in order to deploy this project to run against a different database, we will need to be able to regenerate the PregeneratedViews without running the UI tool. I.e. Regenerate from the command line. The easiest way to do that will be using a T4 template. There is a good article here about using a T4 template to create the views for a MS EDMX model. I started by using their CSharp.Views.tt file. Note: The T4 engine and the Entity Developer tool will each take ownership of the .PregeneratedViews.cs file. So depending which tool ran last, the views may be nested under the .edml file, or under the .tt file. DONE. The EF model project is complete. Before going any further, let’s set up a simple unit test to make sure we have connectivity and can read data. Add a new Test Project to the solution. We name each test project with the same name as the assembly it tests, suffixed with .Test, so in this case, it is: Acme.BirdTrap.Model.WidgetEF.Test. Copy or link the app.config from the Model EF project to the Test project. where item.Description == "Changed Widget"
Create an OrderedTest class that runs the CRUD operations in the right order: Load, Create, Edit, Delete, then TryToLoadAfterDelete. To run the OrderedTest, open the Test View pane (menu Test | Windows | Test View). Select the Ordered Test and run it. It should be green lights all the way. In this part of the walk through, we have created the Entity Framework model project for an Oracle database using the DevArt dotConnect drivers and its accompanying Entity Developer tool. In the next part of the walk through, we will set up the IdeaBlade DevForce models that sit on top of the EF model. Until then: Get outside and enjoy the sunshine. Which is to say, “Take the dog for a walk!” Woof! Finally, publishes the necessary files to IIS. Today, I need to figure out how much has to change to get this project onto our QA server. Pointing the QA environment to the QA database. An aside about Oracle schema ownership. As a SQL Server developer, there are several Oraclisms that confound me. I’m not sure that this is one of them, but here’s my take on it: In SQL Server, most databases are created by dbo and most tables are created as dbo. Security is then applied to users and groups to grant access to various tables. If you need to create a Dev database and a QA database for the Production database named AccountingSystemDB, you might create a new database, again as dbo, called AccountingSystemDEV and another called AccountingSystemQA. In Oracle, this notion of separate databases is superseded by a notion of separate schemas WITHIN a single database. There is no obvious corollary to dbo. The Oracle system user serves a very different purpose, perhaps relating more to the notion of sa in SQL Server. Instead, an Oracle DBA will create a Schema Owner (i.e. a user?) and then create the Schema as that owner, granting rights to that Schema to users. For example, the Oracle Server has a single Database instance, within which, you will see three schemas named ACC_SYS_DV, ACC_SYS_QA and ACC_SYS_P. Within each schema, you will find that schema’s version of the tables. I.e. ACC_SYS_DV.ACCOUNT, ACC_SYS_QA.ACCOUNT and ACC_SYS_P.ACCOUNT. Also, a lot of database apps, use a single Application User Id to access the database, relying on the Application to implement security. (Or at least, ours does.) For each of the three environments, this Application User logs in to one of the three Schemas. connection="metadata=res://ModelEF/ModelEF.csdl| res://ModelEF/ModelEF.ssdl| res://ModelEF/ModelEF.msl; provider=Devart.Data.Oracle; provider connection string=" User Id=APPDV; Password=*****; Server=devTns.world; Home=oraodac11g_home1;Persist Security Info=True""
Above we see the Oracle server instance devTns.world, and the Dev database schema owner APPDV. There is also a Home= entry pointing to the developer’s OraHome that needs to be removed. If this was a SQL Server solution, the schema owner would be the same (whether it is dbo or not) in the AccountingSystemDEV and AccountingSystemQA databases. In Oracle, this is not the case, so I am curious if I will need to update the Schema tag in the EDML (EDMX) . If so, the promotion to QA will force a rebuild, not just a reconfigure. connectionString="metadata=res://*/ModelEF.csdl| res://*/ModelEF.ssdl| res://*/ModelEF.msl; provider=Devart.Data.Oracle; provider connection string=&quot; User Id=APPDV; Password=*****; Server=devTns.world; Home=oraodac11g_home1; Persist Security Info=True&quot;"
Since we are using CruiseControl.Net (CCNet) for our automated build, and since we are using Nant for some of the less “build-ish” and more “configure-ish” tasks, I was able to add a Nant task in the CCNet project configuration that does a string replace in all the EDML (EDMX) and .config files, and then uses the T4 Template technique to recreate the Pregenerated Views. And that’s it. Before CruiseControl.net starts running the actual tasks, it runs this Nant task to prepare the source files for the QA environment.